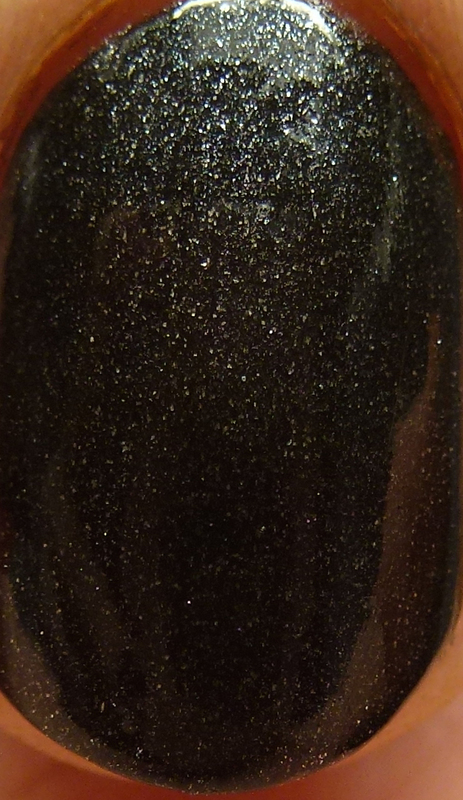 Jiji is a silver shimmer in a black base. 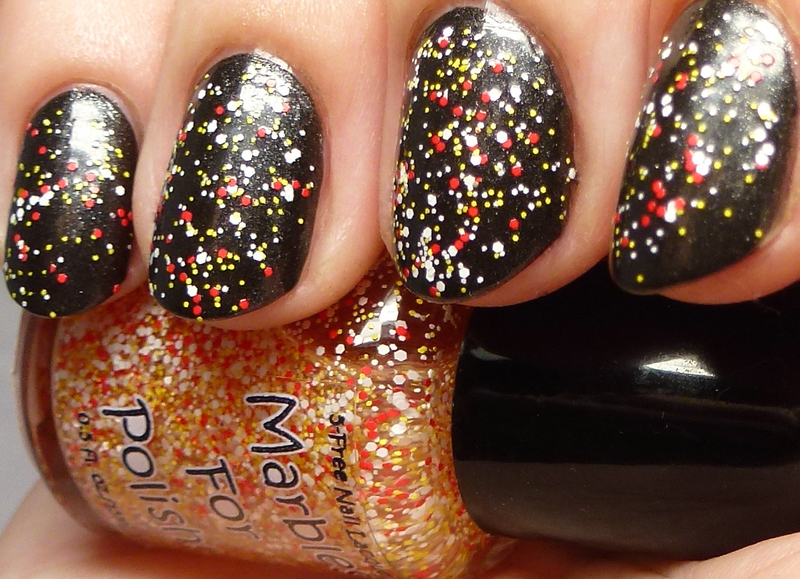 Two coats, possibly one if you are careful. 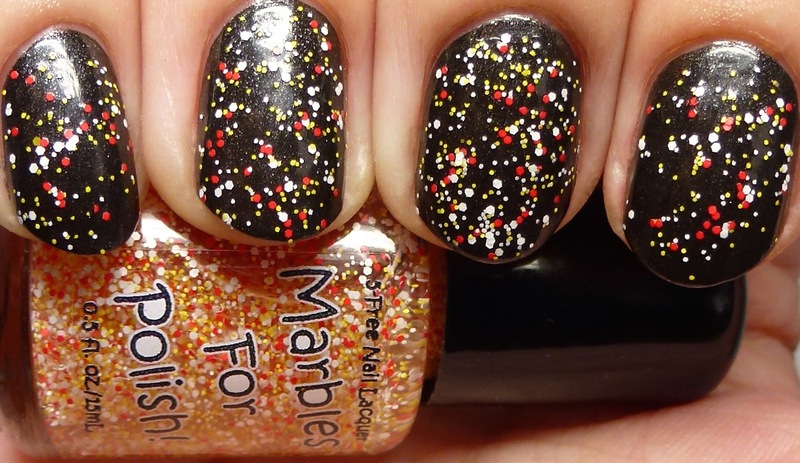 This is a simply gorgeous formula, easy to use and very opaque. 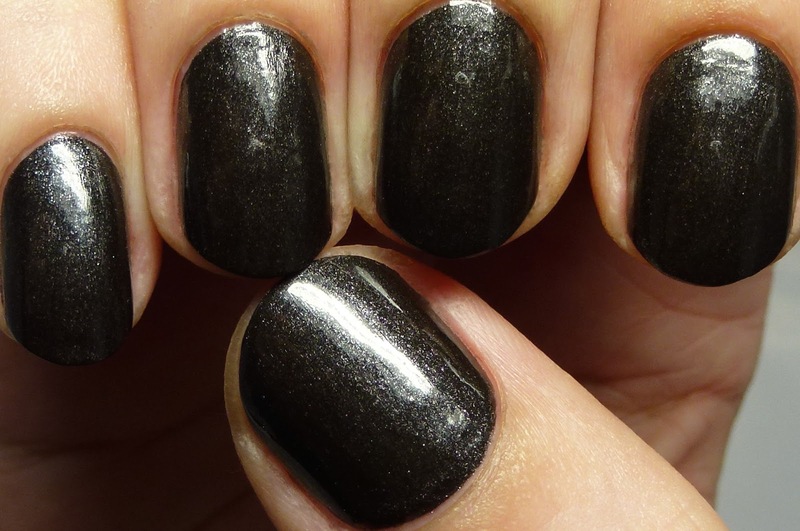 It appears like graphite on your nails. Kiki features black microglitter, matte red and black hex glitters, silver shimmer, and duochrome violet-to-pink flakes in a pink lace base. Three coats. 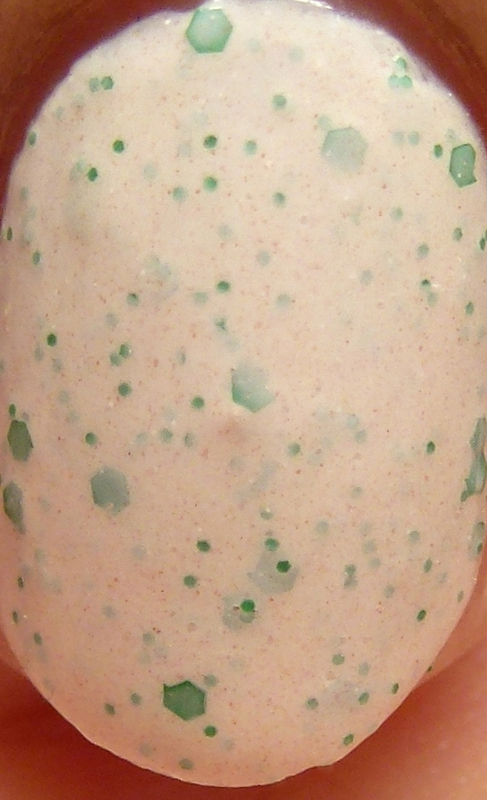 It is definitely a full creme, rather than crelly base. It has a subtle, delicate effect. 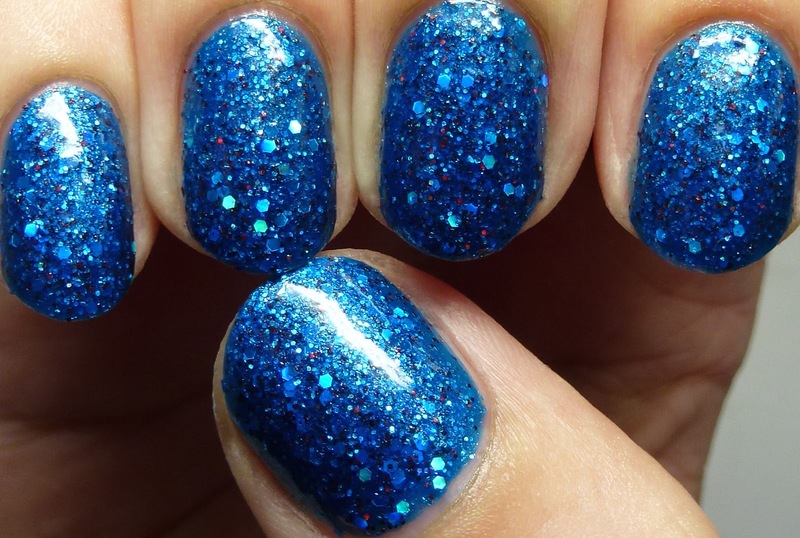 To increase the appearance of the glitter and flakes, give it a quick swipe of acetone after the last coat. I am wearing it as is in these pictures. 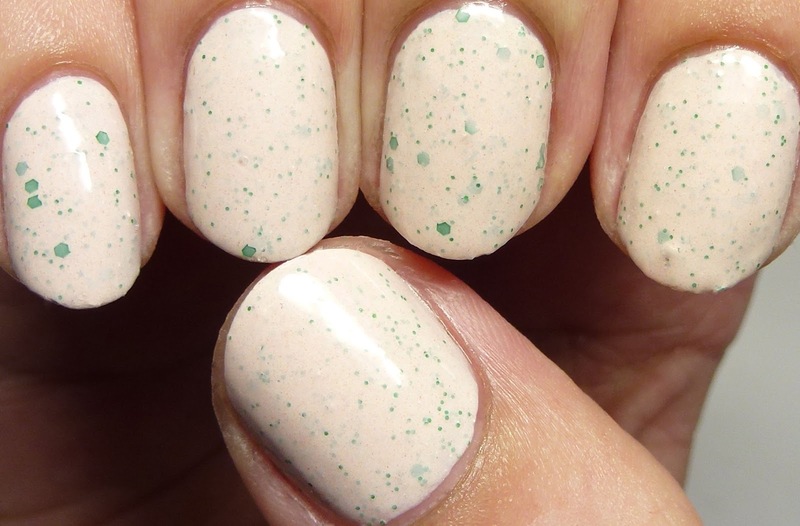 Osono has matte green microglitter and hex glitter and red shimmer in a cosmic latte base. Three coats. 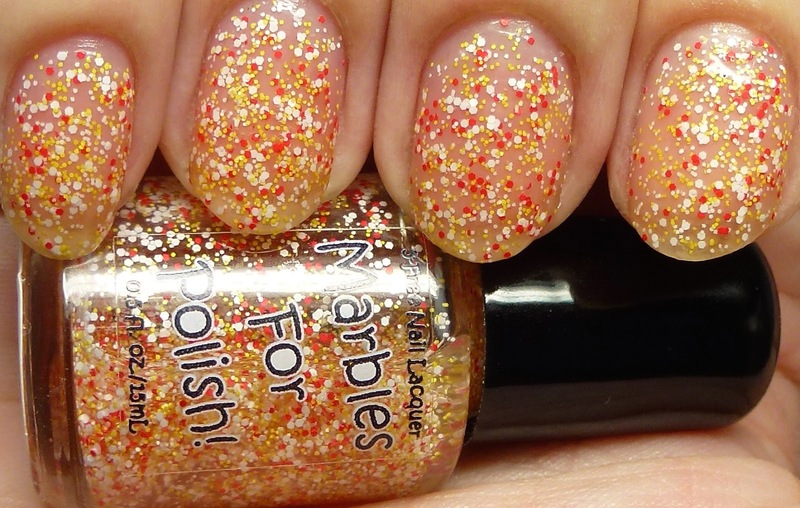 I adore these delicate glitters. 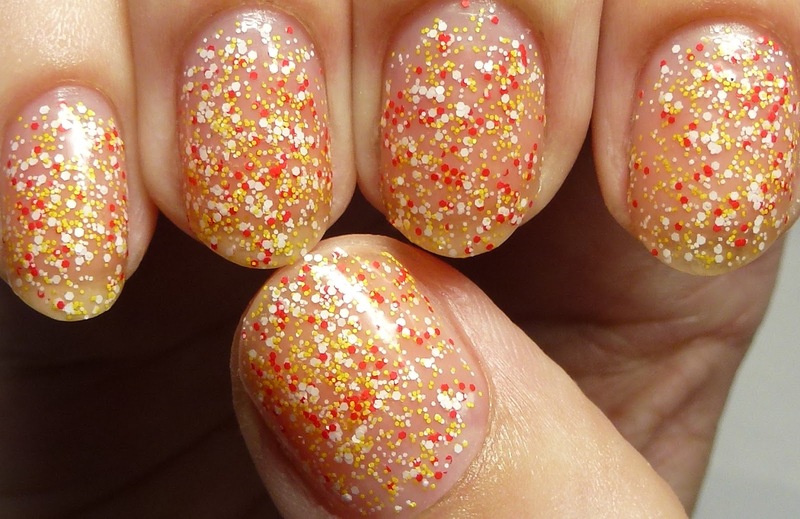 The red shimmer is scarcely visible but adds a little texture to the appearance of the base. 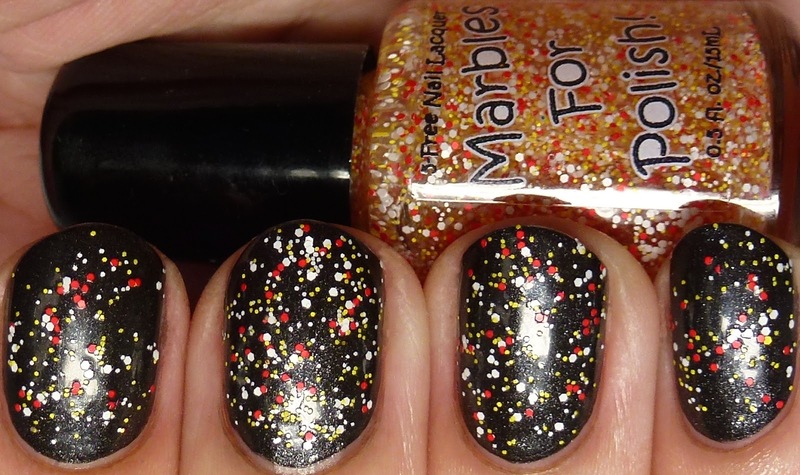 Again, if you want the glitters more apparent, you can swipe it with acetone to remove some of the base from the surface of the glitters. 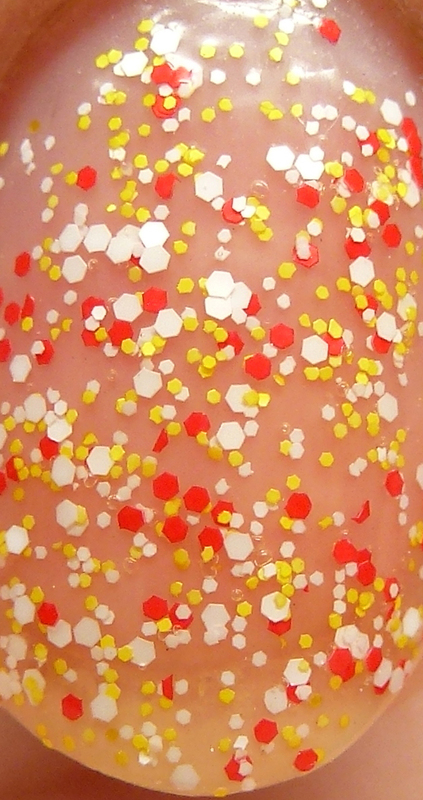 Tombo has white, yellow, and red matte hex glitter in a clear base. 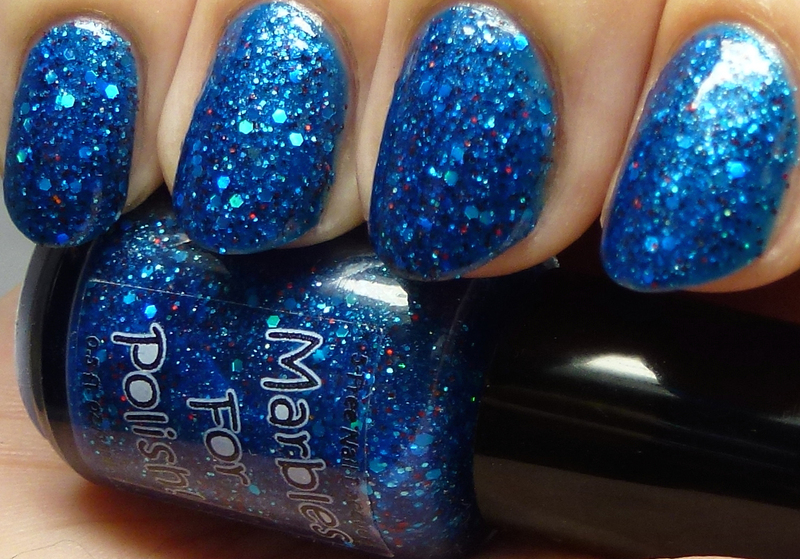 Four coats. I wore this both alone and over Jiji as shown here. Finally I have Ursula, which is really intense, with lots going on in the mix. 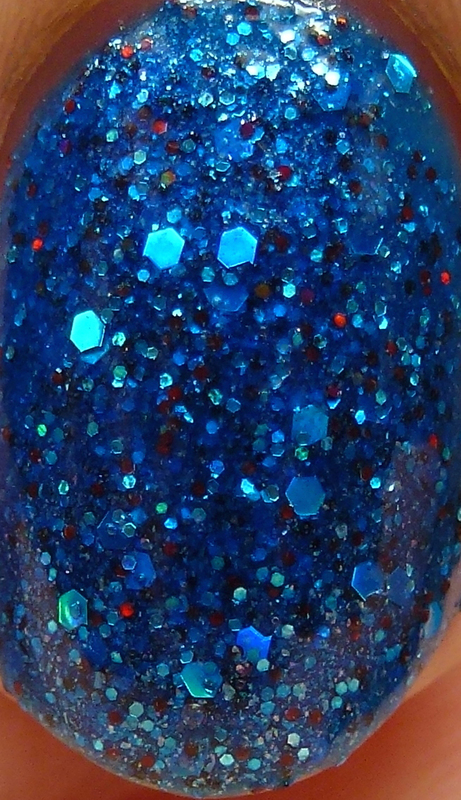 Holographic and red glitter and silver fleck shimmer in a sheer Egyptian blue jelly base. Four coats. 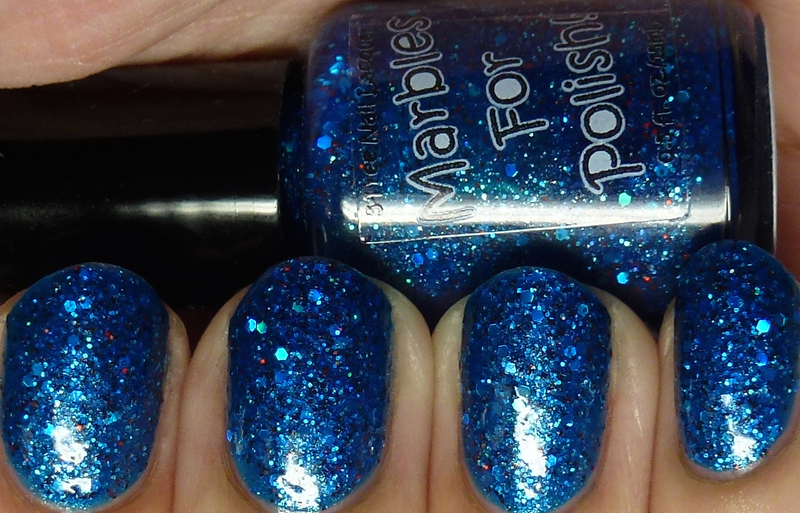 This one did stain my nails blue after wearing it for 24 hours, but most of the staining was gone for me in one shower. 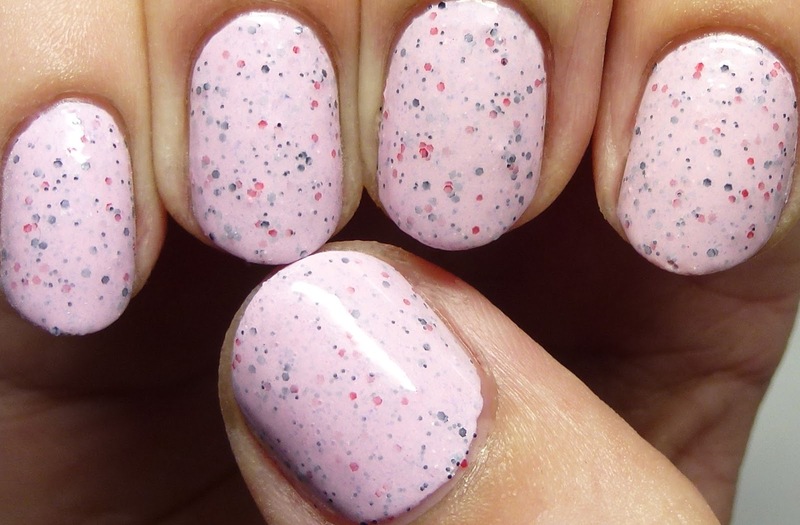 I would advise doubling up on basecoat and covering your nails in Aquaphor or Vaseline before removing it. 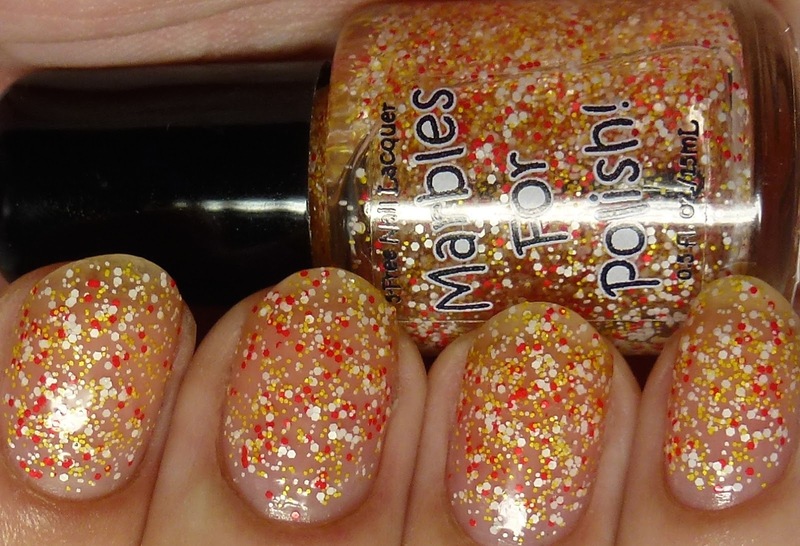 The polishes are priced at $9 each, except for Tombo, the glitter topper, which is $8.50. The full collection is priced at $20 for a mini set and $40 for a full-sized set.